Choosing the right moving company can be a little tricky. You need to fund a reputable mover that is a member of the Better Business Bureau, and there are additional steps you should take that will assure you of finding a mover that is experienced, reliable, honest, and dedicated to treating your furniture and belongings with the utmost care. RE/MAX Masters Millennium can assure you of a quality move when you purchase a home through one of the leading brokerage’s real estate professionals. Home buyers will enjoy the peace of mind inherent to using a reputable mover and can be assured that their belongings will be treated with the utmost care, AND THE MOVE IS FREE! That’s right. When you buy a home through the "Masters of Real Estate" it won’t cost you a dime to move. 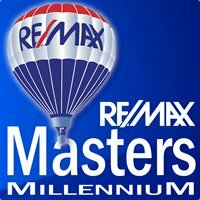 If you choose not use RE/MAX Masters Millennium to make the right move for you here are some helpful tips to ensure a easy move. Get Referrals: Searching the Internet or browsing a phone book for moving companies can be daunting. Start by asking friends, family members and coworkers if they can recommend a moving company, and if you’re working with a real estate agent, ask the broker for a referral. Most complaints from people who have moved into a new home are stemmed from alleged lost or damaged property, charging for unworked hours, arriving late, and not honoring estimates. Following are some simple steps you should take when searching for a mover. Following the Rule of Threes: Don’t settle for the first estimate you receive. Ask at least three different companies to give you an in-person estimate because no company can really give you a thorough estimate without seeing your stuff. Watch Out for Red Flags: Keep an eye out for red flags during the estimate. Most moving companies won’t ask for a cash deposit before the move, so avoid those who do. During the estimate, note how professional or unprofessional the movers seem. If they show up late, seem unsure of their abilities, or can’t answer your questions, look for another company. Also, avoid movers who show up in a rented moving van. Make Sure the Mover is Licensed and Insured: The U.S. Department of Transportation Federal Motor Carrier Safety Administration issues a U.S. DOT number to licensed movers. Check your local consumer affairs agency to find a list of local movers through FMCA’s contacts database. Check with the Better Business Bureau: As mentioned previously, reputable movers will be a member of the BBB and will have a solid track record. Ask About Professional Accreditation: Trade associations vet companies before giving them a membership or approved seal. Look for a moving company carrying the American Moving and Storage Association’s ProMover logo. You can also search for approved companies directly from the American Moving and Storage’s Moving.org website. Verify the Address: Ask for a business card or pull up the mover’s website and then look up the listed address online or through the phonebook. Make sure the moving company’s address is listed and registered under the company names.